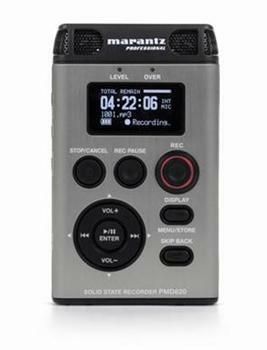 The PMD620 is the pocket recorder of the range, but with fantastic performance. The unit can be held as if it were a microphone with negligible handling noise and very sensitive capsules. It has the ability to record in a wide variety of formats from 24bit stereo 48kHz WAV to 32kbs mono MP3. Five hours of battery life make it ideal for reporting and the included PSU allows it to be just as useful in the office or home. The display is bright and easy to see with several pages of information when required. All in all a great little recorder!